Coach and college counseling administrative assistant Linda Ogden was invited by the DIAA to represent Delaware at the NFHS National Student Leadership Summit, which was held July 18-20 in Indianapolis, Indiana. The Summit provides a forum for adult and student leaders from around the country to discuss contemporary issues facing athletics and activity programs. The goal of this summit is to develop leadership skills that enhance communication, relationship building/sustaining, responsible social media engagement, perspective and inclusion; to participate in a Special Olympian integration event; and to uphold the positive values that years of research have substantiated as a benefit of participation. Each year, the DIAA sponsors its own local Student Leadership Conference at the Virden Center in Lewes, Delaware. This year's conference was held Aug. 5-7, and 31 student-athletes throughout the state of Delaware attended. Tower Hill was represented by seniors Brianna McCoy and Jamie Spruance, speaker Jack Holloway and conference director Linda Ogden. 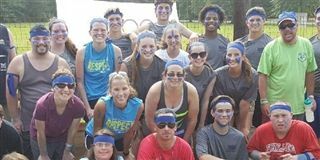 Along with sessions covering effective leadership, sports medicine, conflict resolution and understanding DIAA rules and regulations, the athletes spent the afternoon at Camp Barnes participating in "Special Olympic" activities with special needs young adults.